For BioExplorer, BrainMaster or Infiniti Ship speed, rolling fog, music volume, tunnel transparency, autopilot accuracy and sky visibility are among the parameters you can use as feedback in your designs. Inner Tube can be set to autopilot, played with a joystick, or played with the keyboard. There are 20 levels to play of increasing difficulty. 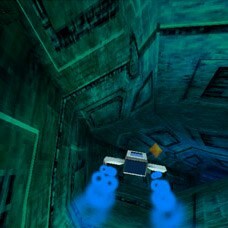 Race through beautiful tunnels, collecting power-up diamonds and trying to reach the tube end and fly out to stunning sky environments before your time runs out. Inner Tube provides feedback that can be controlled by BioExplorer (version 1.3 or higher), BrainMaster (2.5 or higher) or BioGraph Infiniti. To use the games with BrainMaster you must have the BrainMaster Multi-Media Pack. Read Pete’s discussion of the Somatic Vision games. Your computer should have a 64 MB or larger 3D accelerated video card. You may also have to update your video driver. Most computer manufacturers have their latest video driver available as a free download on their website. When you purchase, download your product from your confirmation link and we will email you the unlock code. Once purchased the games are not returnable. Download the free trial to preview the game before you buy. Once the games are installed, if you want to move them to another computer, you must deactivate them first.